It was many years ago when I was first taken to this remote spot. You have to go through private property and then through almost trackless national park to get there. The drop into the Macleay Wild Rivers National Park is impressive. 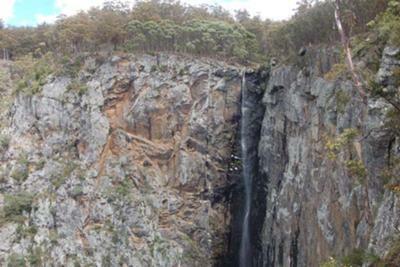 People have abseiled down the side on rare occasions and others have walked into the gorge off the ridge ends, definitely an activity for experienced bushwalkers only! The next time I arrived it was surreal. Fog shrouded the whole thing until the afternoon when we had to leave. Still, there had been no water going over that day either. The third time I visited I was fairly sure there would be some sort of cascade and I was right but, somehow, it’s the sheer nature of the walls that overpower one. The New England region of New South Wales has a plethora of waterfalls, many seen by less people than have climbed Mount Everest. This could well fit into that category.